I’ve noted many recipes on the web in the last year or two for homemade chocolate hazelnut spread. I’ve really wanted to have a go, but neither my blender nor my food processor are up to the job. However, I was recently sent a VonShef 3-in-1 hand blender from Domu to try out and I thought I’d put it through its paces and see if it was up to making a nut spread. I happened to have a bag of cashews to hand, so thought I’d try making a chocolate cashew nut spread rather than a hazelnut one. As you can see from the picture near the bottom of the post, the 3-in-1 is comprised of a hand held stick blender, a mini food processor and a whisk. The blender has a heavy duty motor and comes with two speed settings, 7,000 and 13,500 rpm. The attachments are simple to change and the washing up is so much easier than my stand food processor. For blending small quantities of ingredients to make sauces, pesto and chocolate spread, the mini food processor is ideal. It’s also meant to be good for chopping onions, but I haven’t tried that yet. The stick blender is fantastic for soups and purées and it comes with a sturdy beaker. We used our old one all the time, but it was difficult to wash as it didn’t detach from the motor. This one does. The whisk I have yet to try. The mini food processor was my tool of choice for the task I had in mind. To begin with the nuts ground to a powder and I thought it wasn’t going to work. I persevered on a higher setting and suddenly it turned into a paste. When I added the other ingredients, it went very oily and didn’t look at all appetising, so I added a little water. Miraculously this sorted the problem out and I ended up with a rich and smooth (ish) paste. Never mind on toast, I couldn’t stop eating it this chocolate cashew nut spread straight out of the jar; not something I generally want to do with Nutella as I find it too sweet and a bit cloying. Containing no refined sugars, unhealthy fats nor other unwanted additives, this is a super healthy alternative to your average chocolate spread and it’s very tasty too. Although there were a few grains of nuts left in the paste, it had a very pleasant silky mouthfeel. This success left me elated for the rest of the day and I can’t wait to make some again. I am sending these off to AlphaBakes with Caroline Makes and The More Than Occasional Baker as V for Vegan Chocolate Spread. 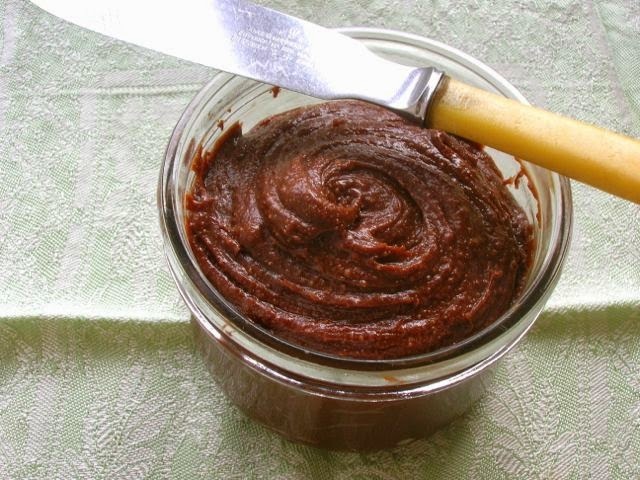 A healthy and delicious take on a much loved chocolate nut spread. Using only six ingredients, this is both quick and easy to make. 1. Dry roast the cashews at 180℃ for about ten minutes or until golden.2. Blend in a mini food processor along with the cocoa powder and salt until finely ground.3. Add the coconut oil and nectar and continue to blend on a high speed for about 2-5 minutes until the mixture has turned into a paste.4. Add the water and blend for another minute until all is smooth. You may want to add more water depending on how thick or thin you like your spread.5. Spoon into a jar and spread some immediately on toast. It should keep for a week or so in the fridge. Domu UK has kindly agreed to give one of my readers a VonShef 3-in-1 hand blender as described above. To be in with a chance of winning, please fill in the Gleam widget below. You will need to leave a comment on this post, answering the question, which then gives you additional chances to enter if you so wish. Gleam will pick a winner at random from the entries received. If you are commenting anonymously, please give me some way of identifying you as I will be verifying the validity of entries. Any automated entries will be disqualified. This giveaway is only open to those with a UK postal address. Winners will need to respond within 7 days of being contacted. Failure to do this may result in another winner being picked. Prizes are offered and provided by Domu UK and Chocolate Log Blog accepts no responsibility for the acts or defaults of said third party. I’d most like to use the stick blender to help me make my own healthy soups. I would love to use the whisk attachment to whip up some frsh cream to top a homemade trifle! The whisk to make some meringues – always wanted to try that! The whisk to make my batter a tad smoother. I would never have thought of making my own chocolate nut spread, sounds great! I’d like to use the stick blender. I’d make meringue with the whisk!! I’d most like to use the stick blender to make tomato soup. I would use the stick blender to make pesto. Love your Cashew Chocolate spread, it looks so good. Interesting you used coconut oil, it seems to be everywhere at the moment! Your lovely blog is an ongoing health hazard for my arteries but oh how scrumptious this looks!! Great timing – my hand held blender has cracked!! I’d use it to make soups! i would use the whisk to make whipped cream for desserts. I love that moment when nuts turn to nut butter in a grinder! I would use the whisk to make lemon meringue pie!!! i’d use the whisk more to make whipped cream and frosting. I would love to enter this but live too far away 🙁 I love my stick blender but have missed the little food processor attachment since it broke. The nut butter looks great – am sure you will have great success with more nut butters in your new blender – though apparently roasted nuts do better than raw nuts and I have had great success with roasted nut butter. I would eat it straight out of the jar too! I’d use the stick blender to make some soup with – and I want to do it right away as it’s a cold, wet miserable day and I’d really love some hot soup! I’d use the stick blender first – we’re into soups in this weather and it would be perfect for blending our apple and parsnip soup. The parsnips, having been frosted, are making gorgeous soup at the minute. OMG this would work in my nutribullet too!… I love this idea and simply never thought about making a spread in it!… Genius! off to buy cashews! Whisk! So I can bake lot of cakes! Sounds lovely. I have made a almond spread before. For sure I have to do some nut spread again in the future. the chopper feature looks fab. I’d love to try making soup with the stick blender. It’s something I’ve always wanted to do. The whisk for a smoother pancake batter. I’d use the stick blender on nuts and frozen fruit to mix with yogurt. I would most like to use the stick and blender and would use it to blend soup. I’d use the whisk to make yummy cakes for my family! The stick blender to mash up home made hummus. The whisk for my morning low-carb yoghurt/cream/fruit/nuts concoctions! I’d use the mini food processor more as I can make my own curry paste and marinades. I’d use the whisk to help bake chocolate cake! I would love one to make soups for my father-in-law as his old one broke. I would love to use the stick blender to make some amazing smoothies with it. I would use the food processor attachment for everything I currently use my cumbersome processor for. The first thing would prbably be spaghetti and meatballs. would love to win the blender to save my weak wrists. I’d use the stick blender for blitzing soups. Whisk attachment to make light and airy sponge cakes. I would use the stick blender for soup. Whisk! for Whisking up a batch of Cakes. The blender for quick curry pastes and salsa. So sorry I don’t live in the UK! But thanks for the recipe!!! This chocolate spread looks delicious! I’d like to try the stick blender and would try it out on making some soup. The stick blender for smoothies, I have worn my old one out! I would most like to use the stick blender to make some soups to warm me up! i’d use the whisk to make cakes!! My answer is the stick blender.. I saw you used this spread in a later recipe to make chocolate brownies, they look great! Thanks for sharing with Alphabakes. The chopper attachment would be my favourite and I’d chop onions with it. I’ve tried all the tricks, a spoon in my mouth (it just makes me gag), a pair of swimming goggles, none of them work; this would be perfect. The whisk for cream and eggs. The whisk for cream and meringues. The whisk attachment to make cupcakes! I would use it to make that chocolate cashew nut spread. It sounds delicious! The stick blender to make smoothies and soups. My wife says she wants to try and make some cakes 😀 So she’d make good use of the whisk attachment. I would make smoothies with the the blender attachment. This would be really useful. I would even try making a meringue.. The whisk, so I can make a yummy lemon meringue pie! I would most like to use the stick blender to make healthy smoothies and warming smooth soups. I want to start making soup from fresh local vegetables so this would be ideal. I would use the whisk attachment to make my pancake batter light and airy. Thank you! Hi Olivia, you should see a link right at the bottom of the page which will take you to Gleam. ooh I hadn’t realised you had a blog here as well. Love it. I would love to try the stick blender for soups, always wanted one of those. Haha Alison, this is my blog now. I’ve moved Chocolate Log Blog over and this is brand new. The whisk so I could have a go at making meringues. I’d love to make my own chocolate sauces – fondants and mousse. I’d use the stick blender to make sweet potato and chorizo soup! The whisk, and I’d make meringues to go into a raspberry eton mess! My stick blender has just died! So would love to replace it and continue making lovely wholesome soups! I’d use the blender for whizzing my soups.